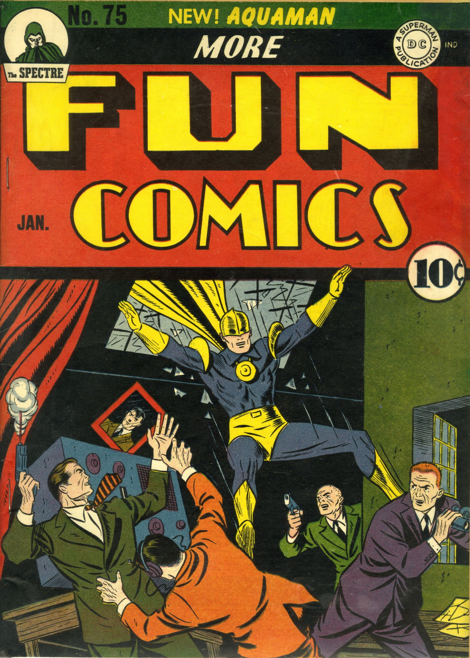 The cover of More Fun 80 (June 1942) actually corresponds to the story inside! It was not standard practice yet, but always a pleasant surprise when it does. 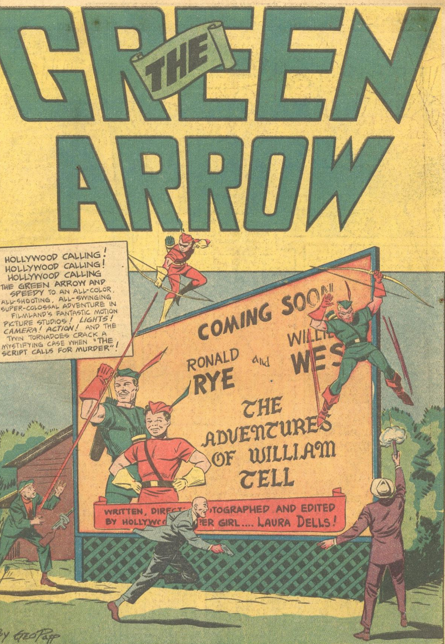 The story is the first of countless Green Arrow tales that play on the William Tell idea. I suppose they could be counted, but even I am not inclined to do so. 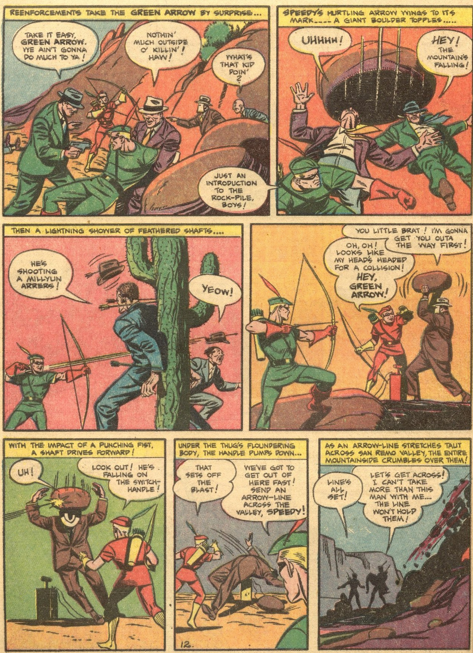 This tale has Green Arrow and Speedy hired to be stunt archers in a film on that topic. 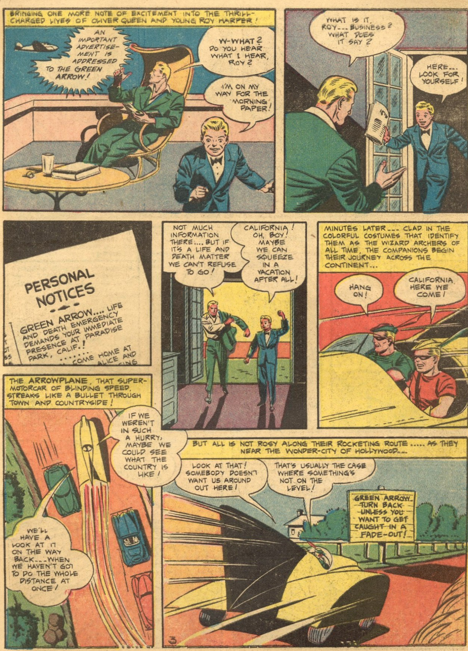 Oliver Queen and Roy Harper apparently lounge around the balcony to their apartment in suits when not on a case. They head to Calfornia by Arrowplane. Which still means the Arrowcar at this time. The film set is plagued by “accidents,” and the archers discover that there is a gold mine on the property, and the crimes were intended to drive the crew away before they could discover it. Dr. 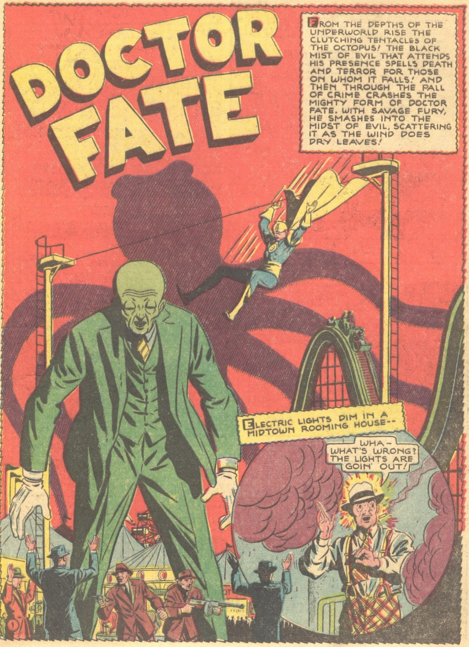 Fate is pitted against a large, green mobster, called the Octopus, in this Gardner Fox/ Howard Sherman tale. There is nothing nautical about the Octopus’ criminal endeavours. He leads a gang who run a carnival, at which they rob the patrons. Kent Nelson and Inza come to visit, and get caught up in taking it down. Howard Sherman really seems to have given up on this series. Inza, hanging for her life, looks completely resigned to dropping to her death. 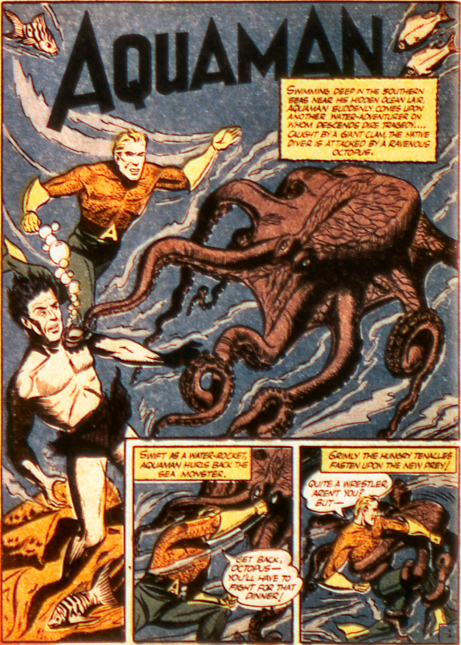 The Octopus tries to gas Fate to death, but fails, and Dr. Fate beats the crap out of him. A disappointment. Black Jack returns, getting a job on a pleasure yacht, and then convincing the rest of the crew to mutiny and hold the guests for ransom. But it’s not the plot or the villain that makes this story mandatory for inclusion in my blog. 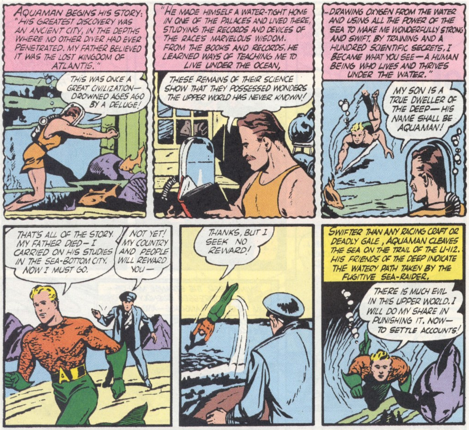 We see Aquaman still needs to beat up sharks to make them do what he wants. 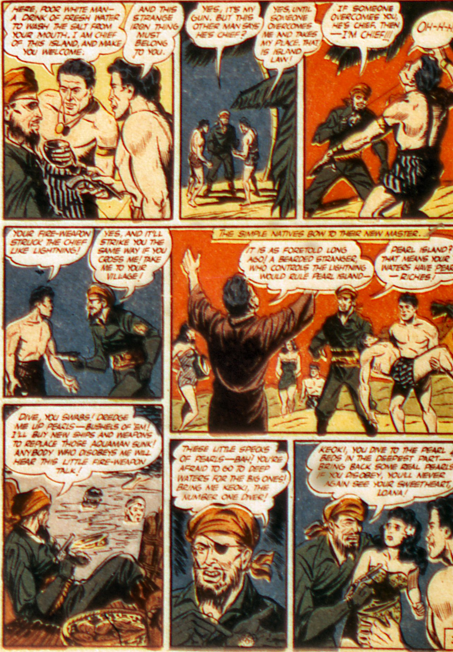 But we also see him converse with a fish for the first time, getting the information needed to track down Black Jack. 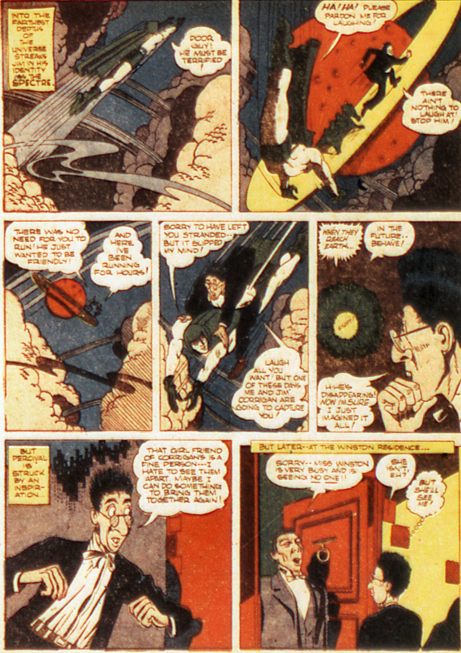 This scene is very casually introduced, as if it were no big thing, but it’s a major development in the scope of his powers. 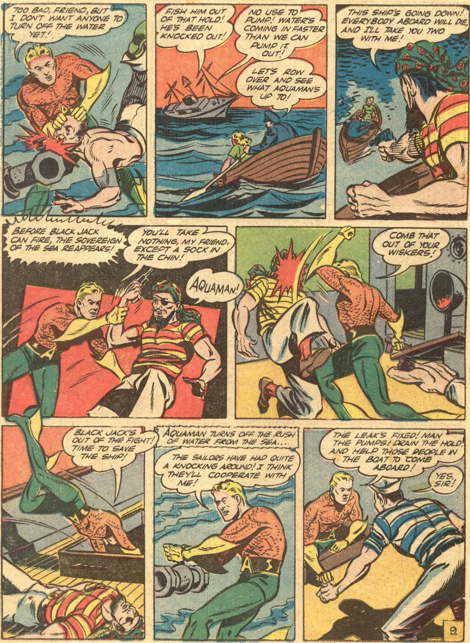 Aquaman catches up to Black Jack and beats the tar out of him and his men. No fish for the final battle. Black Jack is not done, though, and returns a few months later. 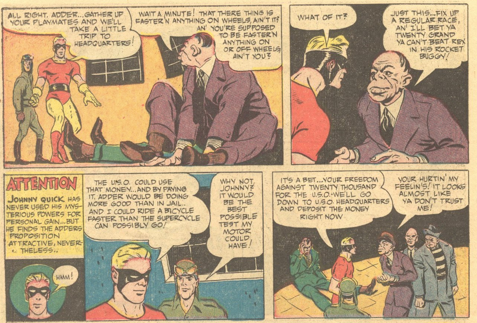 Johnny Quick deals with a crooked gambler, the Adder, who tries to manipulate a charity event Johnny is racing in. 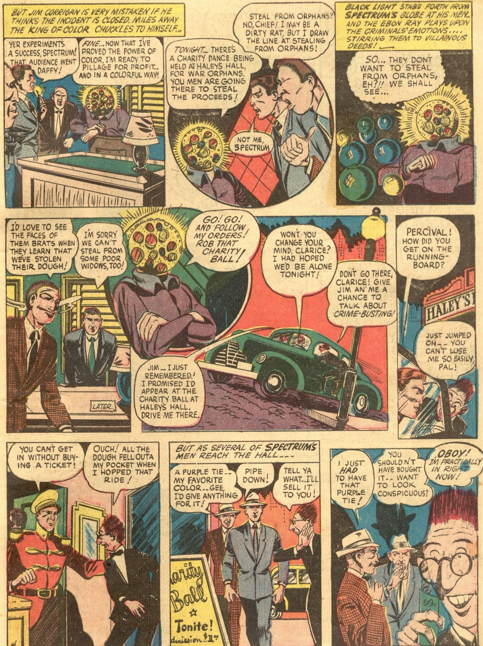 Once again, it’s the superb art by Mort Meskin that makes this tale. The whole things plays out almost like a situation comedy. 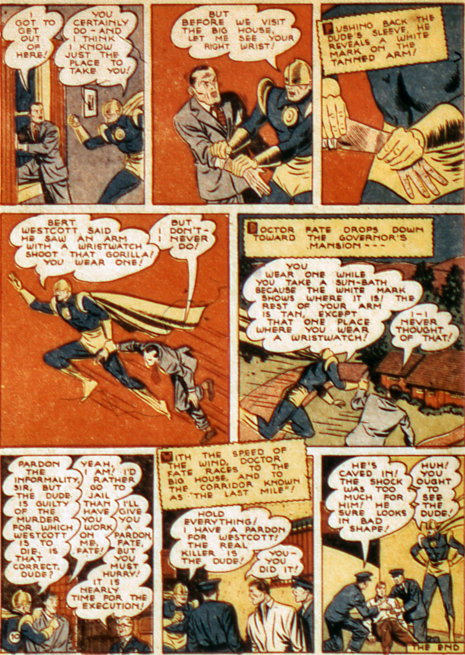 Johnny innocently agrees to take part in the race, unaware of the villain’s schemes. But on the day of the race, he wakes up with laryngitis! Oh, no! 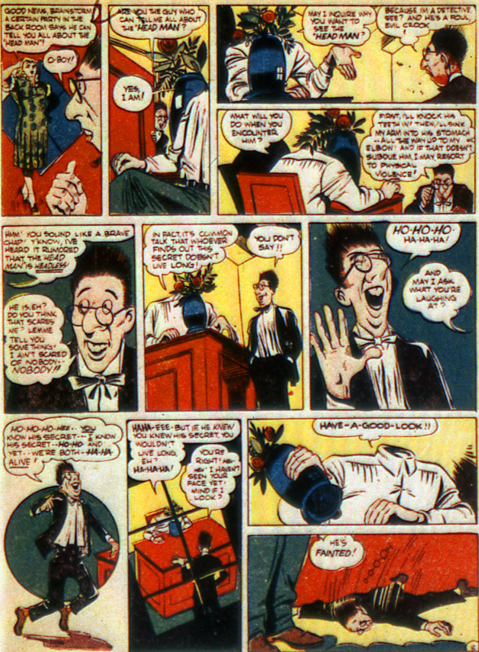 Clever Johnny uses a loudspeaker to broadcast his speed formula loud enough that it can be heard, though he disguises it amid gibberish. And of course, he triumphs. But the story does raise a curious point. Why is the volume the speed formula is said at significant? Is there a “speed god” who needs to hear it? 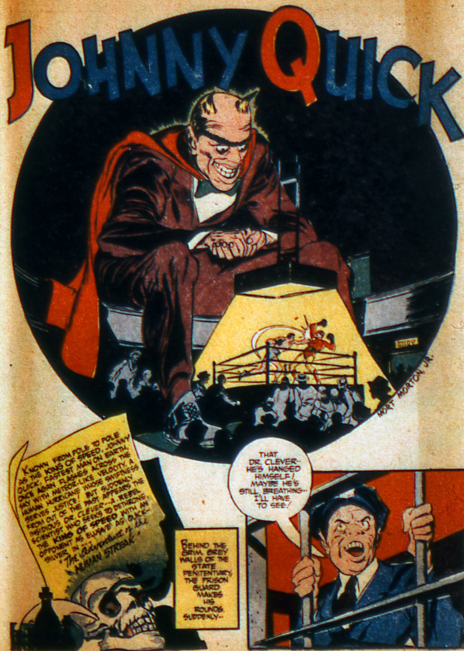 Percival Popp faces off against the King of Color in this Jerry Siegel/Bernard Bailey story, and the Spectre is kind of involved as well. I like the bizarre globe helmst the King of Color wears, and although it’s exact attributes are never specified, it can create hypnotic effects, and also read emotions! Could have been an interesting villain. Clarice Winston returns in this story. Earlier I said she made no further appearances in the strip, but obviously I was mistaken. 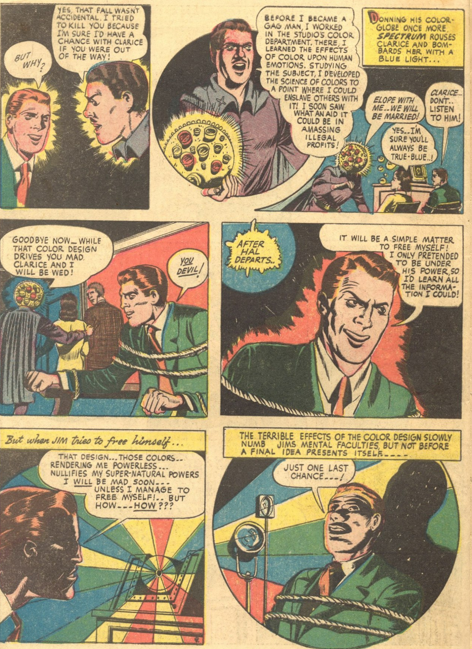 It’s Jim Corrigan who saves the day, really. 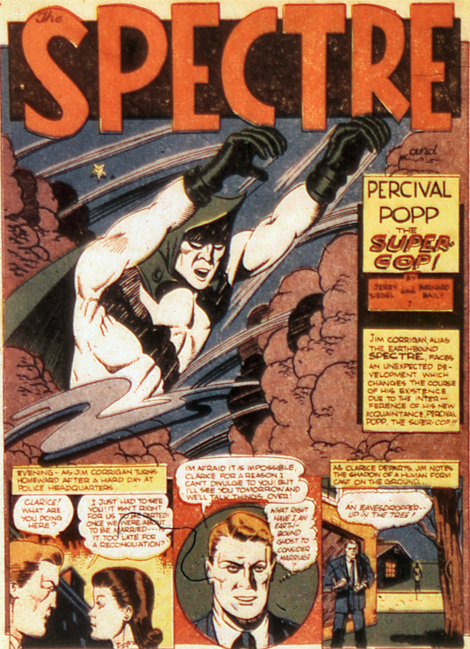 Not the Spectre or Percival Popp. 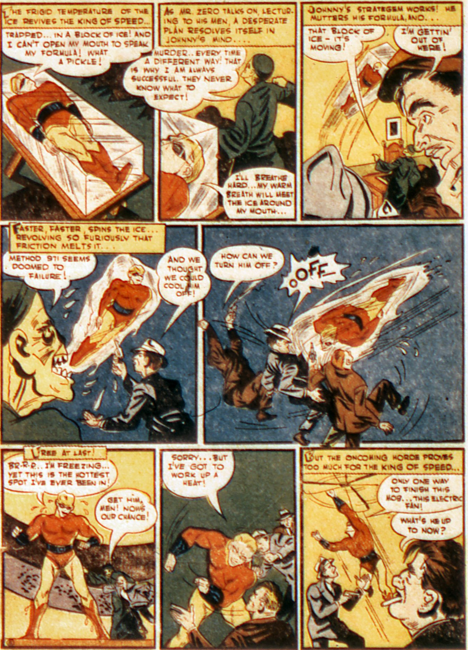 Corrigan simply goads the King of Color, pretending to get captured in order to learn his plans. 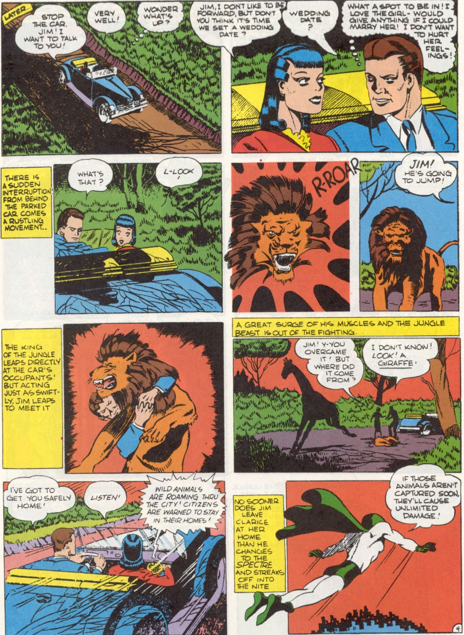 Jim almost falls under the color spell, but the Spectre force enables him to resist and escape. Dr. 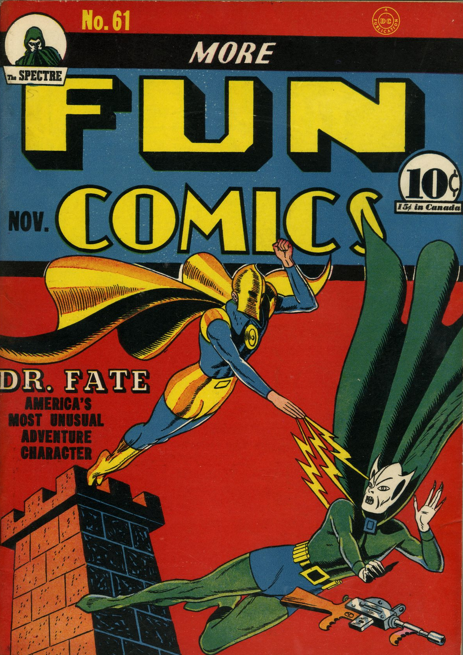 Fate gets his last cover on More Fun 76 (Feb 42), but has already lost the lead spot in the book to Green Arrow, who will take over the cover with the following issue, as well. 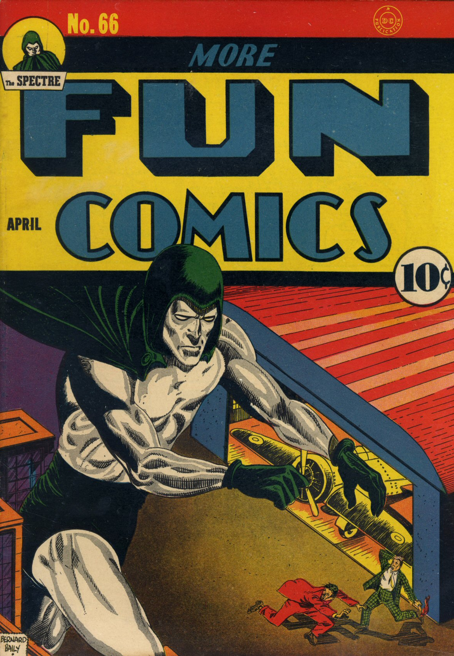 An entertaining Green Arrow story opens the issue, as he and Speedy investigate a haunted castle, which is really a hide-out for an international jewel thief. 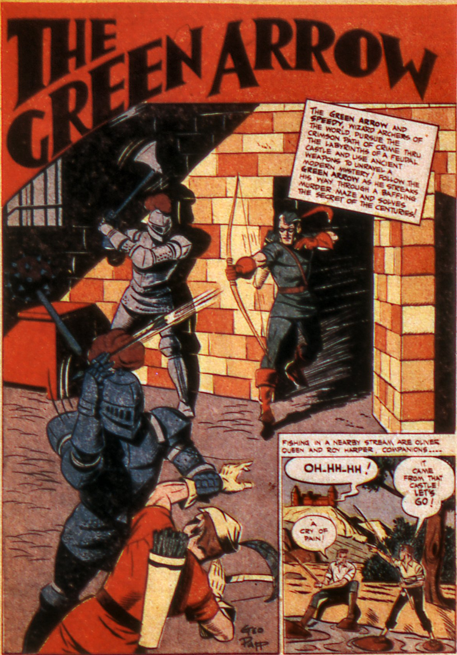 The story allows the heroes to get into action in a medieval looking setting, fighting against hoodlums dressed up as knights in armour. 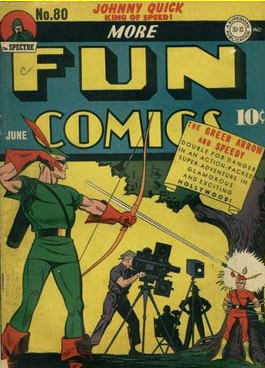 No trick arrows yet, but a great trick shot, as Green Arrow fires off a shaft to hit the controls on the Arrowcar (which is still called the Arrowplane), in order to make it drive on its own. 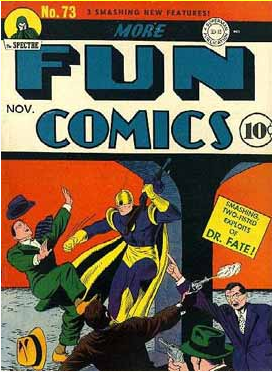 The cover for this issue actually reflects the Dr. Fate story inside, a rarity! 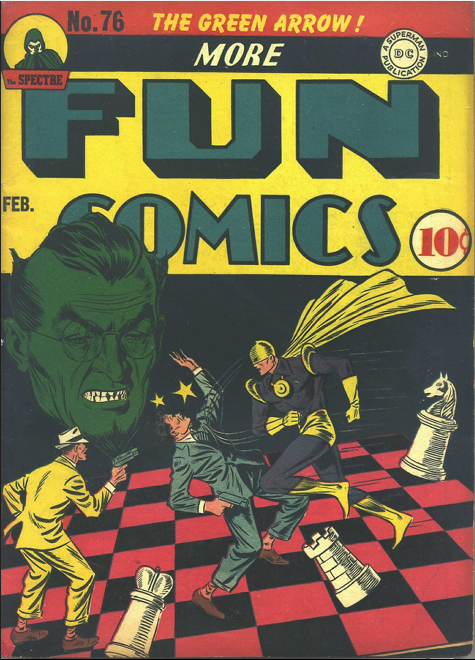 Gardner Fox and Howard Sherman pit Kent Nelson against a criminal chess master, but nothing past the splash page is impressive. Once again, the story is just a loose framework in which Dr. Fate displays no magical abilities, and runs around beating people up. And once again, he gets knocked out by gas. With that happening so often, you’d think he would change the mask back to something more protective. 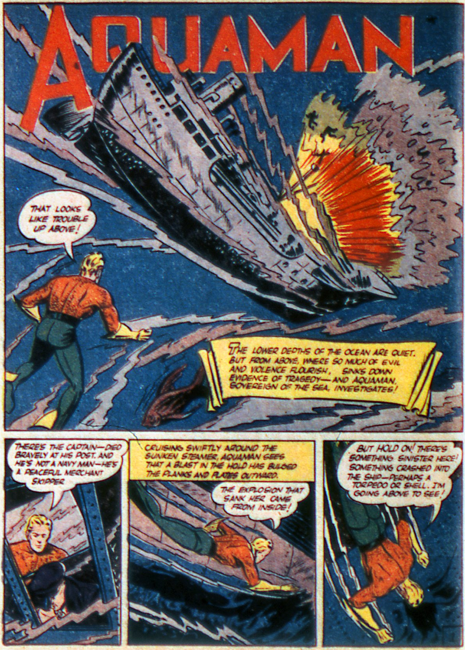 Aquaman deals with a sunken ship in this story. It’s a fairly run of the mill plot, although not a bad tale. 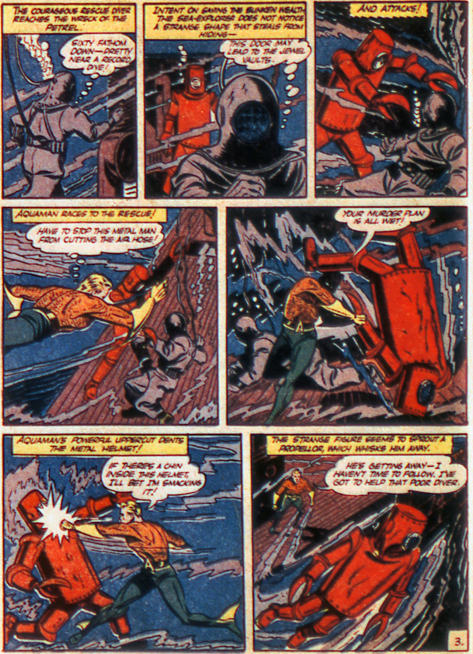 Down in the wreckage Aquaman has to deal with a diver in, for the period, very advanced gear, complete with pincer hands. 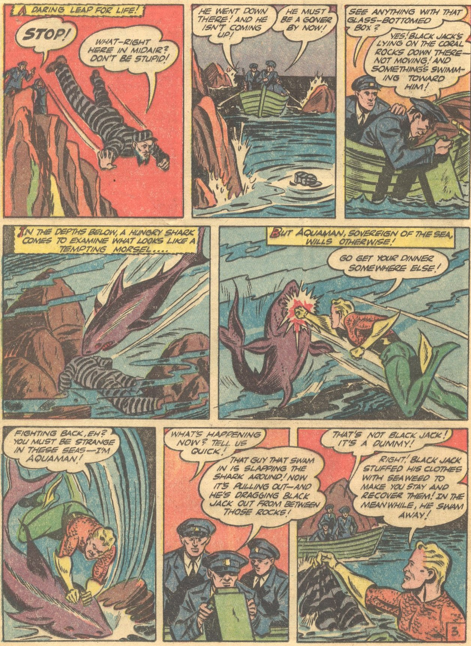 And though the fish are not identified, it sure looks like he is able to command sharks at the end of this tale. Maybe they are meant to be dolphins though. Dr. 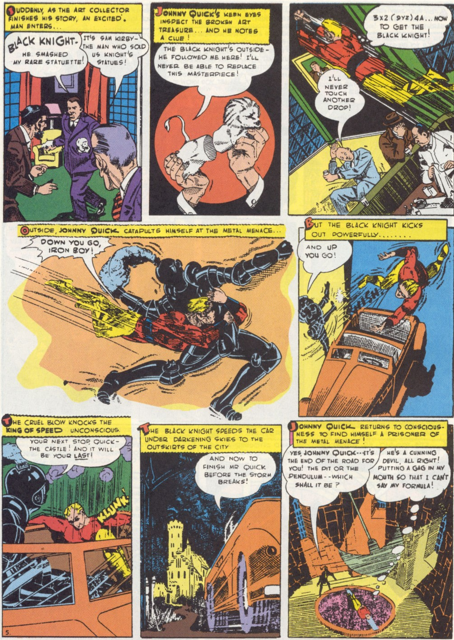 Clever returns to get vengeance on Johnny Quick, as Mort Meskin takes the artistic reins on the series. Dr. 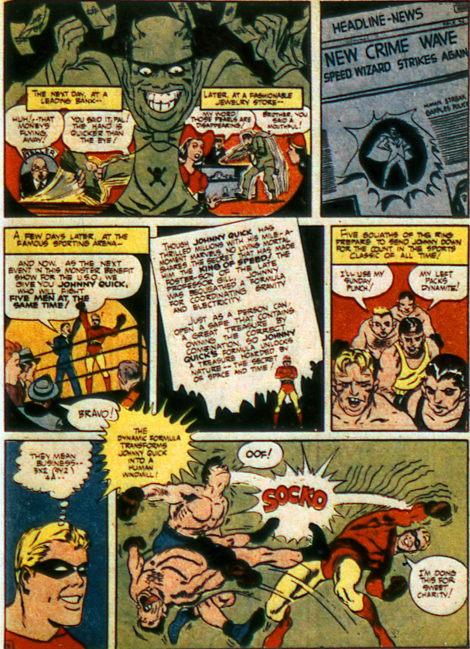 Clever has developed a machine that gives his henchmen super-speed, and he pits them against Johnny Quick – in a boxing ring. 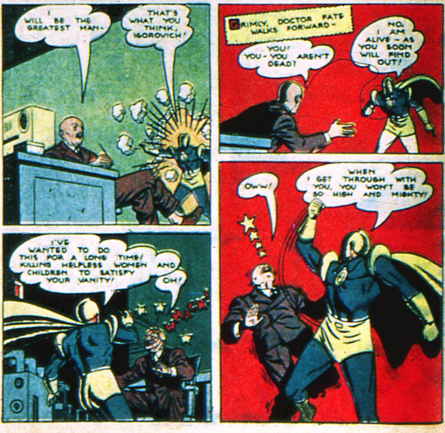 Clearly humiliating Quick is far more important than getting rich to this villain. 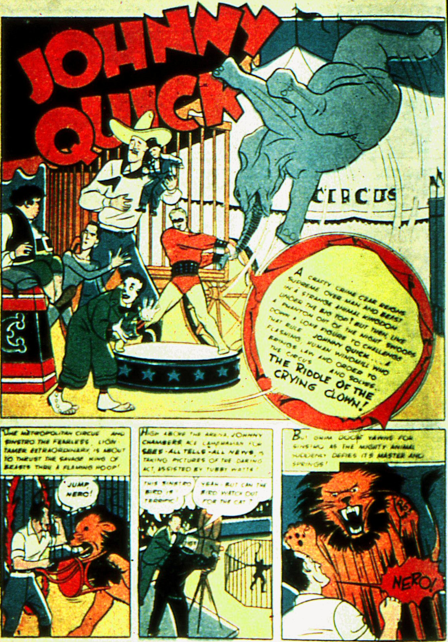 Johnny defeats Clever’s men simply by reversing the machine, and then using it to steal their speed. Dr. Clever returns in a few months. 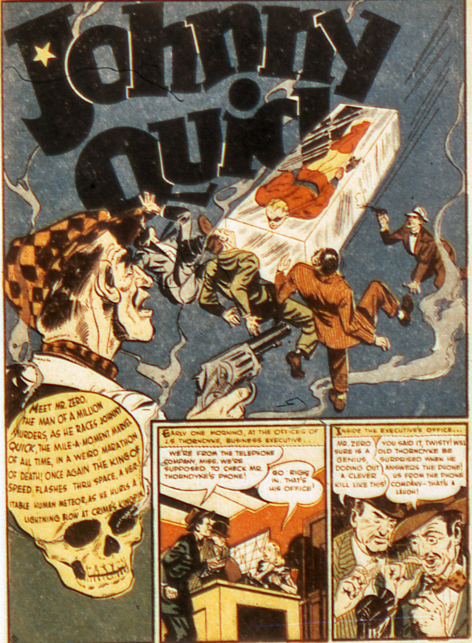 Clip Carson has his final adventure in this issue. 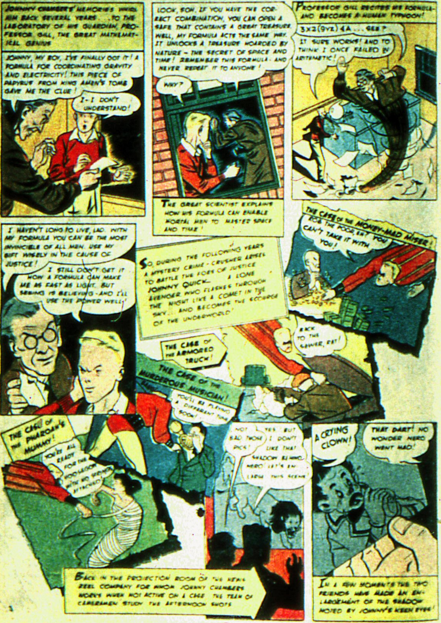 The last two issues had him in Buenos Aires, and then Montevideo, but this final tale takes him all the way to China. 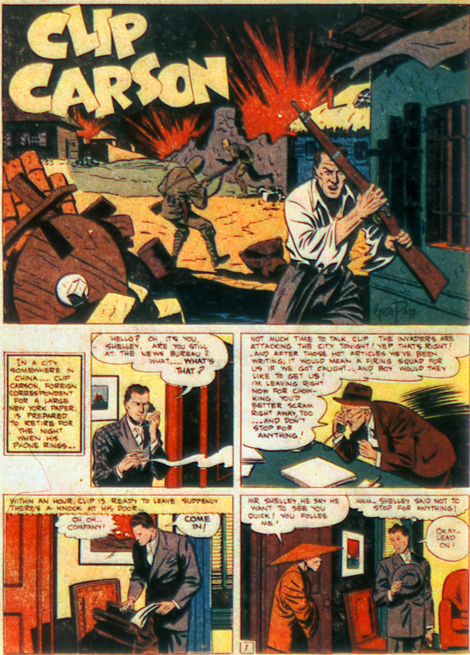 It’s no more gripping than any of the other generic outings Clip Carson has had, but it does stick him right in the middle of the war, between the Chinese and Japanese. 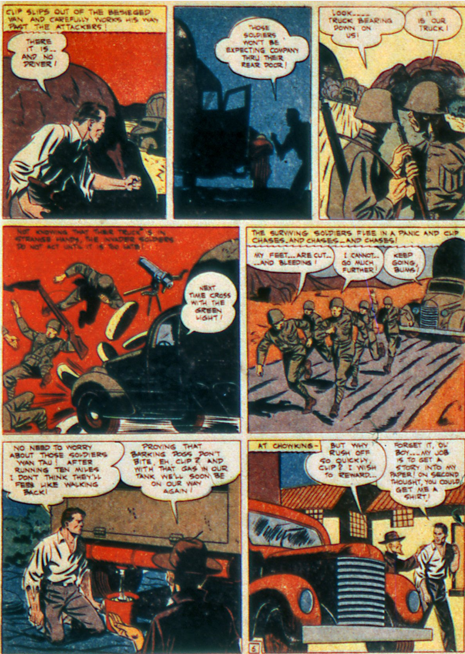 Considering that the bombing of Pearl Harbour occurred only a couple of weeks before this issue came out, I have no trouble assuming Clip immediately joined the army, and probably tried to attack Japan single-handed. And died. 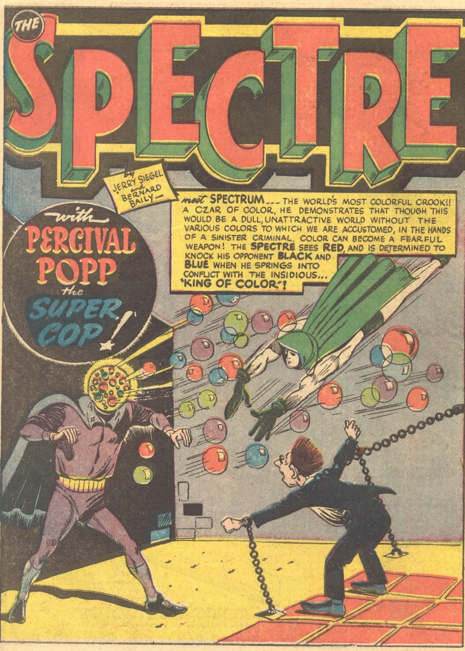 The Spectre story in this issue is once again largely a Percival Popp tale, as he keeps trying to get on Jim Corrigan’s good side, but is only aided by the Spectre. 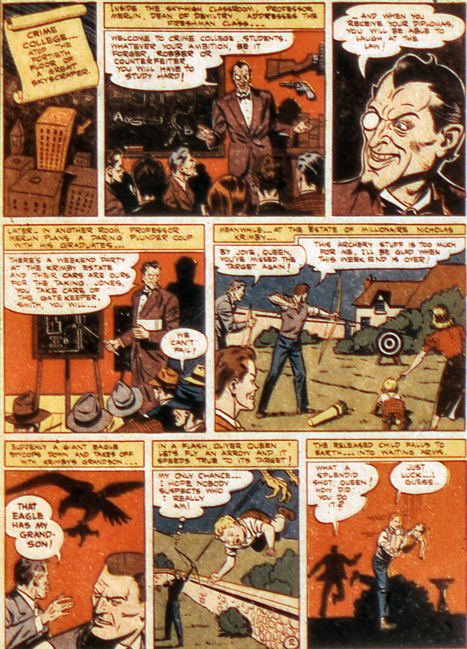 As usual, it was written by Jerry Siegel, with art by Bernard Bailey. 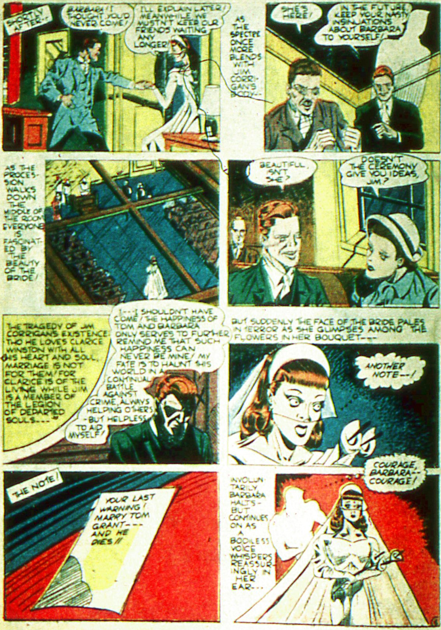 Clarice Winston makes her final appearance in the Spectre series in this story, still trying to figure out her relationship with Jim. 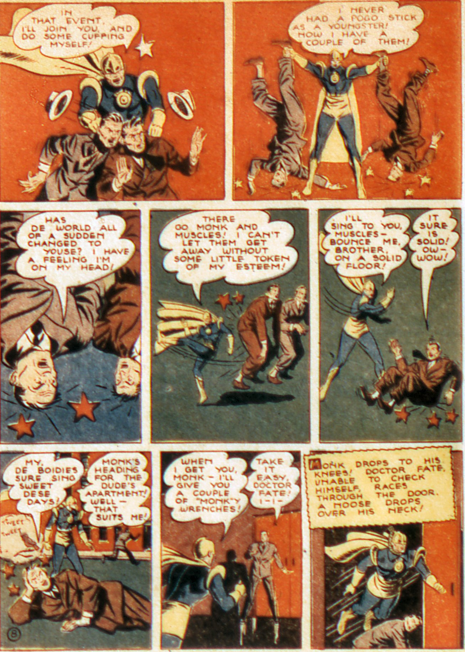 She does make one final appearance a year or so down the road, in an issue of All-Star Comics, but later continuity eliminated her (quite specifically) from that story. 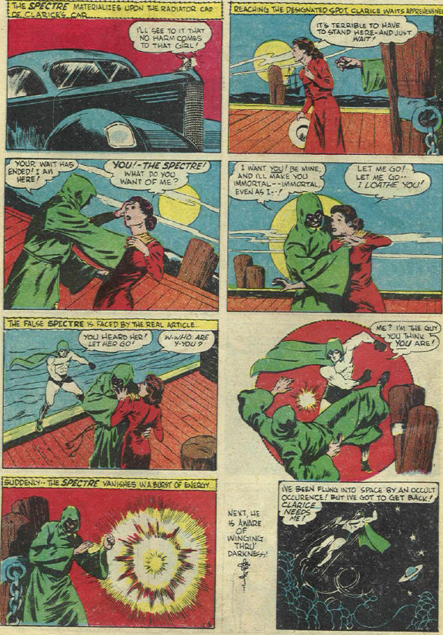 She appears again in All-Star Squadron, largely in flashback, and her real next outing is in the Ostrander/Mandrake run of the Spectre. 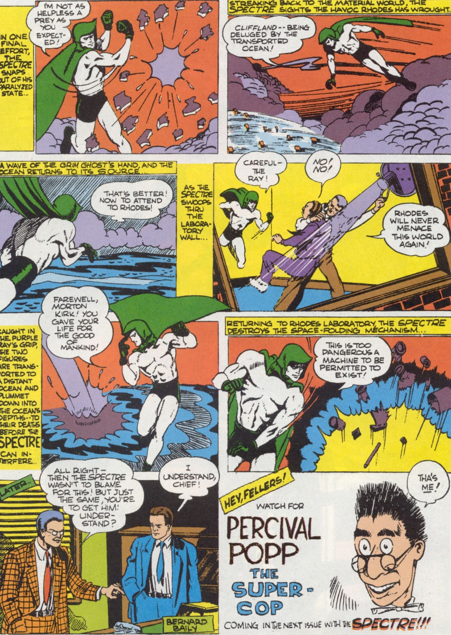 Percival Popp (and Jim and the Spectre) are on the trail of an apparently headless man who goes around kidnapping athletes. 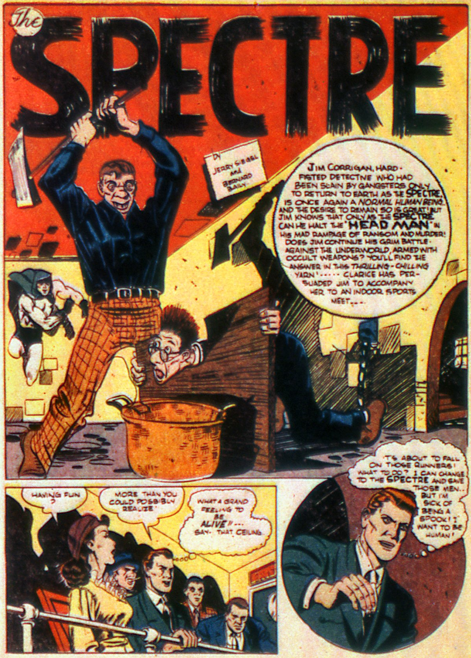 The Spectre reveals that the Headman in fact has a really really tiny head, hidden down in his shirt. Could have been a creepy scene, but not with Percival front and centre. 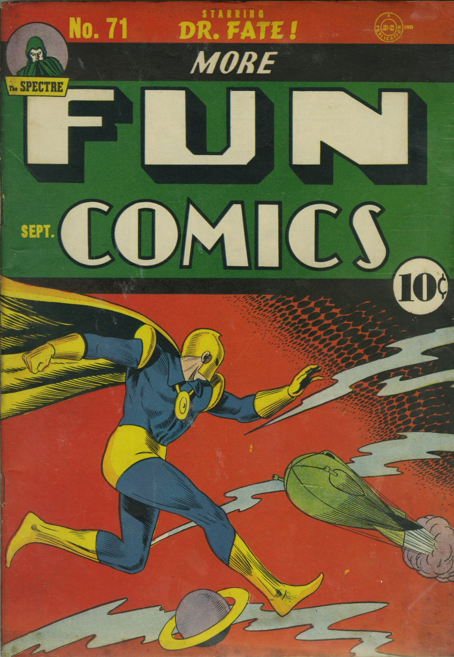 With issue 73 (Nov 41), More Fun Comics became almost entirely super-heroes. 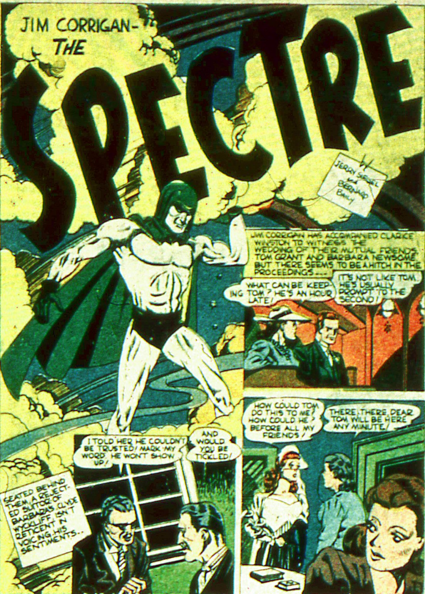 The Spectre, Dr. 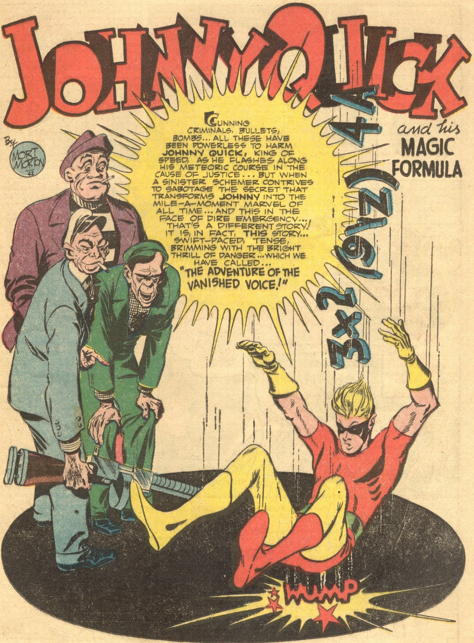 Fate and Johnny Quick were joined by Green Arrow and Aquaman, and the only other series still going were the long-running Radio Squad, and another Clip Carson adventure, this one in Hunduras. 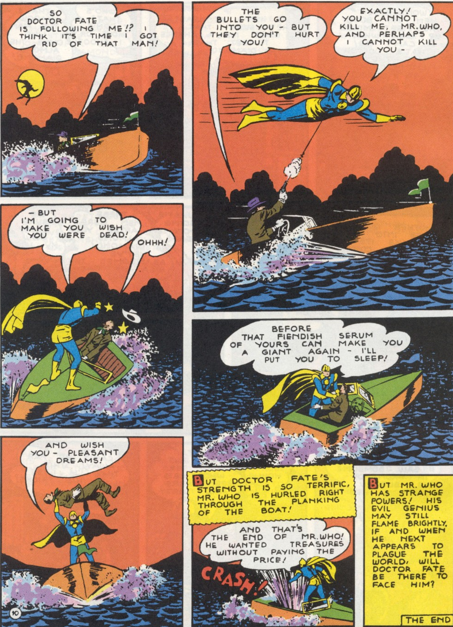 After his debut, Clip had beaten up Seminoles in the Everglades, and actually helped an Inuit man in Alaska. 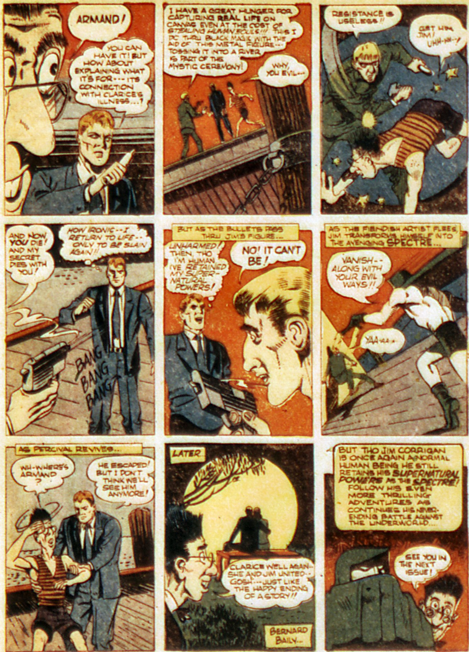 In the previous issue, he solved a murder while on vacation at a Dude Ranch in Arizona. From this story till the end of his run, Clip’s adventures would be scattered around the globe. 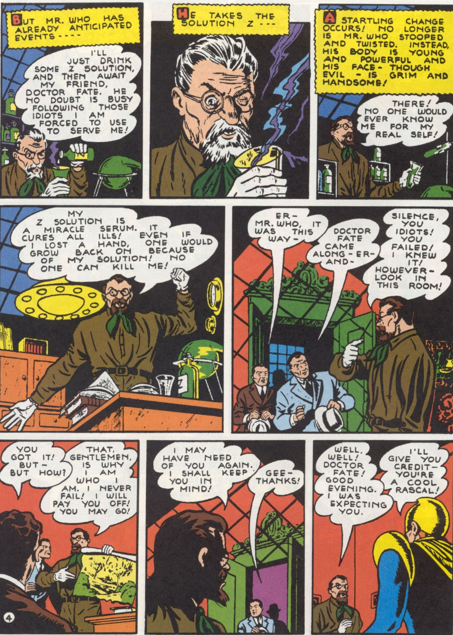 Mr. Who debuts in this Gardner Fox/Howard Sherman tale, another mad scientist, but with enough character to be fun. And a “Z” solution that allows him to grow to giant size. 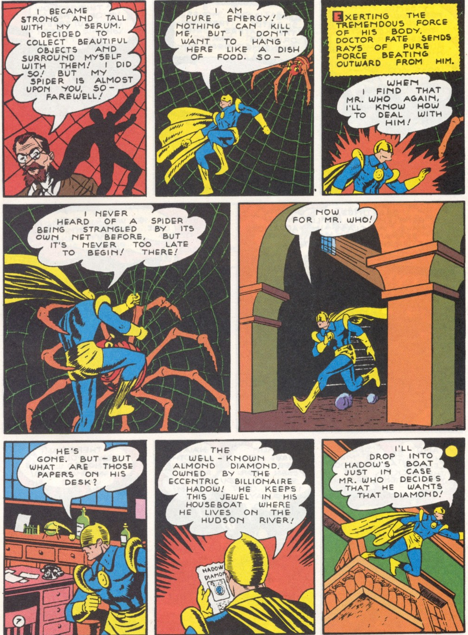 I enjoy the page of Fate fighting with the giant spider, Mr. Who heading out to commit a crime, and leave the hero to die. Dr. Fate is able to emit energy to free himself, but fights the spider bare-handed. Dr. 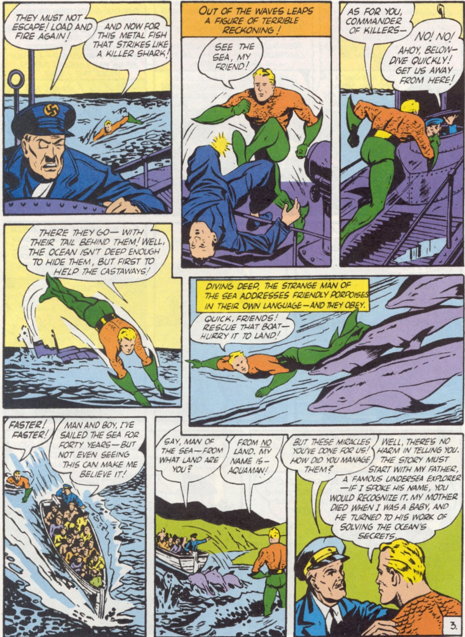 Fate hurls him into the water at the end, but the story leaves open the possibility that he survived – and he most certainly did, appearing in the following issue. 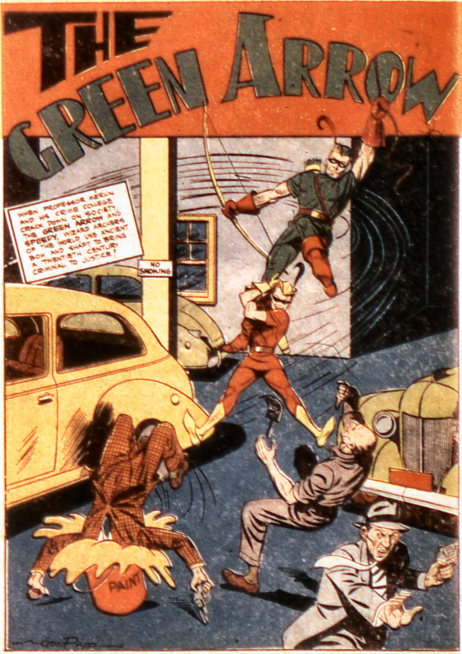 Green Arrow and Speedy debut, created by Mort Weisinger and George Papp. 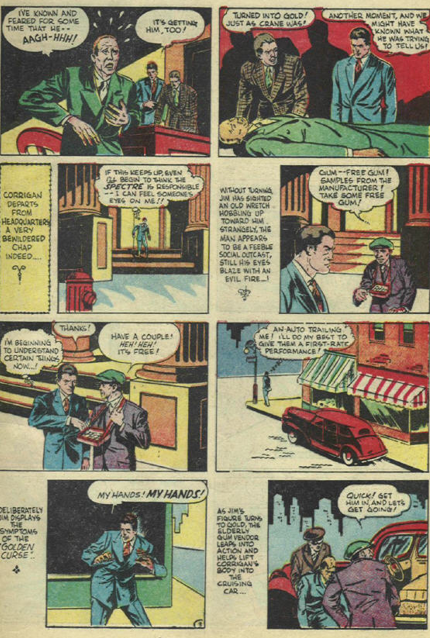 Oliver Queen and Roy Harper both have brown hair in this story. 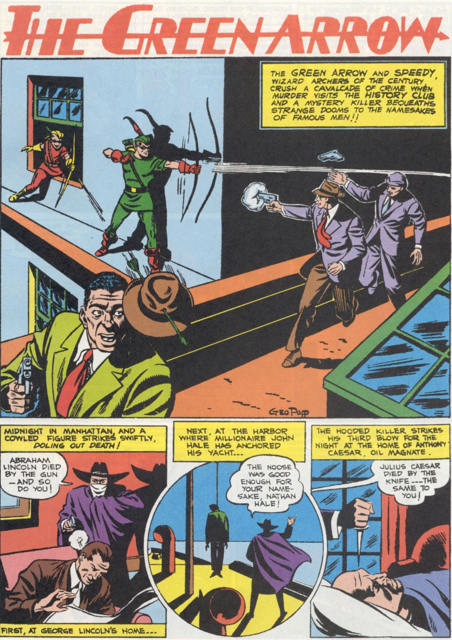 The colours of the two heroes hair, as well as their hats, gloves and boots would alter almost regularly all the way into the 1960s. 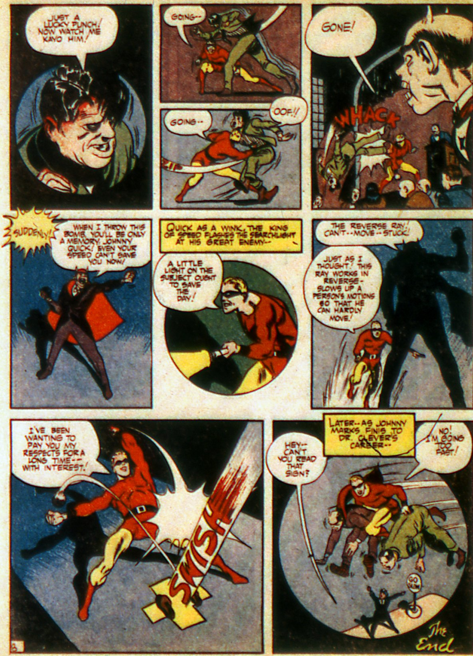 Green Arrow and Speedy are already operating as a team, and mention is made of a previous case. 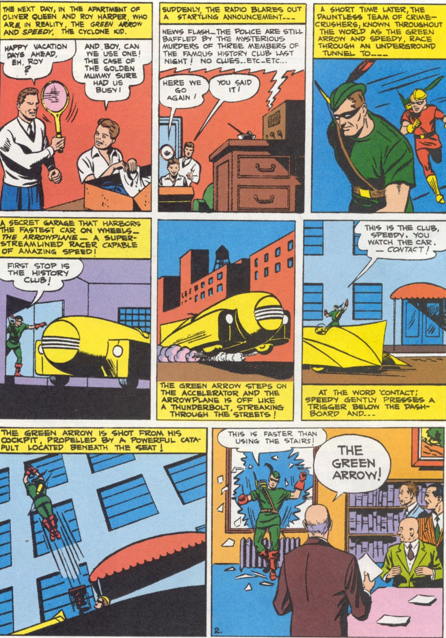 They already have what would later be called the Arrowcar, but here is termed the Arrowplane. There would later be an Arrowplane that was an airplane, not a car. 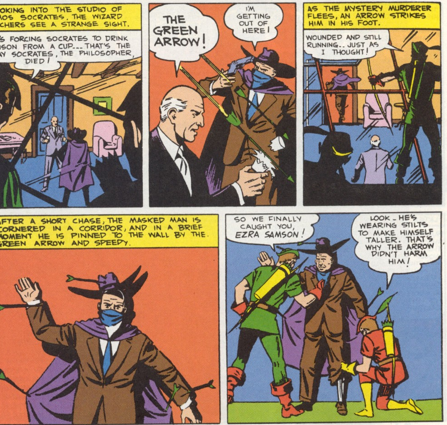 While the obvious inspiration for the character is Robin Hood, in reality more stories and elements would be drawn from the Batman series. 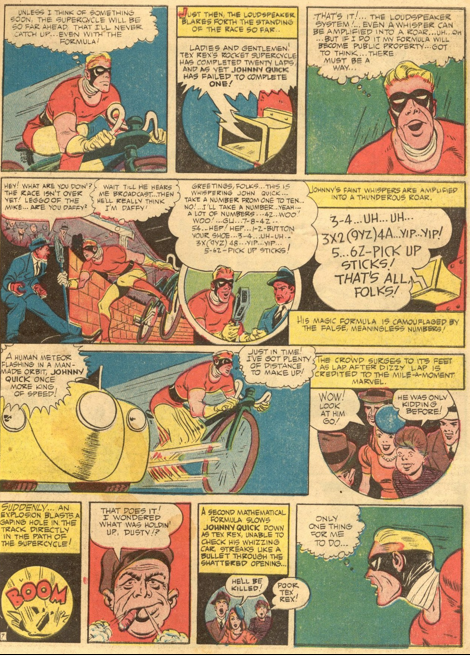 Already there is a boy sidekick, and a vehicle named for the hero. The story is a standard mystery. Murders among a group of historians, who share names with historical figures. The archery is all straight forward as well, no trick arrows. 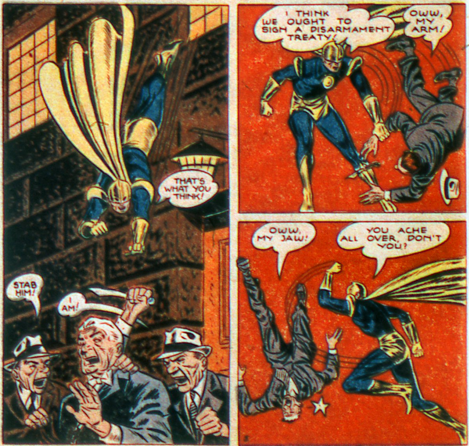 I really like Ed Moore’s art on this Johnny Quick story that pits him against the Black Knight, who mysteriously goes around destroying statues. 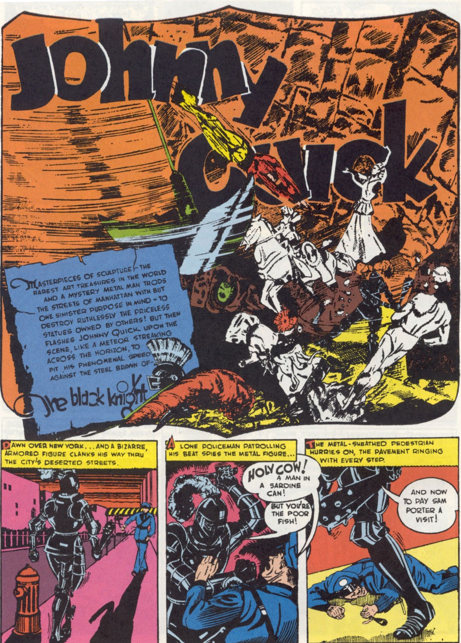 Johnny and Tubby Watts are filming when the Knight goes on a rampage, and Johnny trails him, but gets captured. 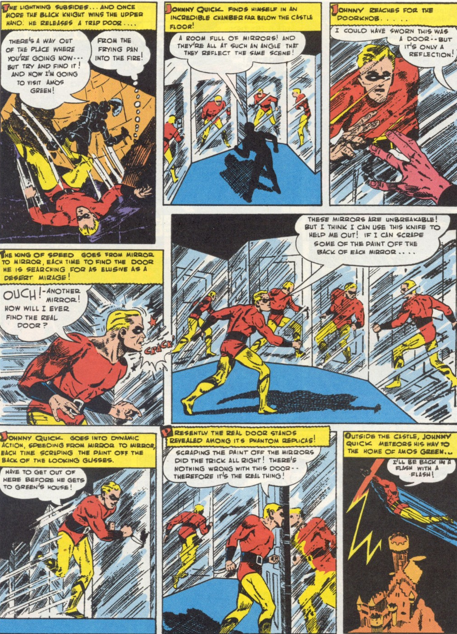 The glass room makes a great trap, and foreshadows the distinctive way speed would come to be shown in this strip – multiple images of Johnny in the same panel. 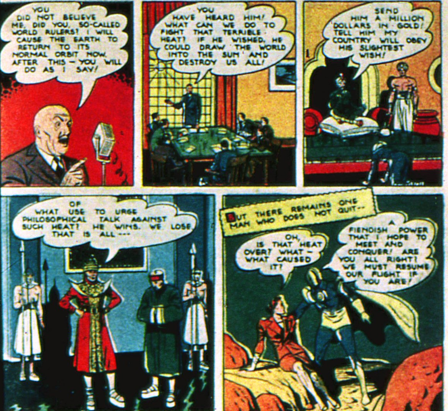 He escapes and exposes the Knight as a robot, in the control of an unscrupulous art dealer. 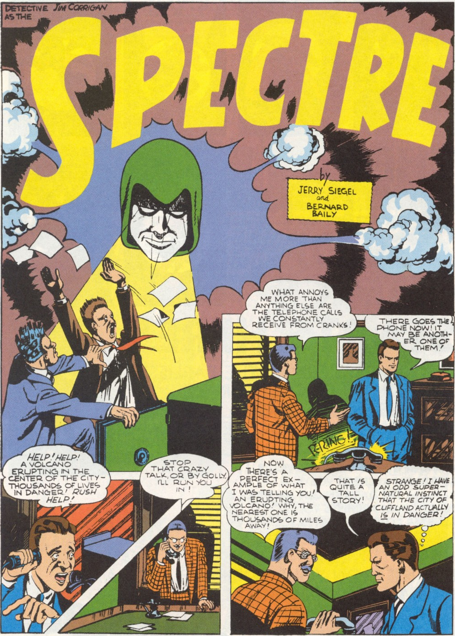 This is the final Spectre story by Jerry Siegel and Bernard Bailey before the series changes irrevocably. And it has some weird moments, but is about par for the course. 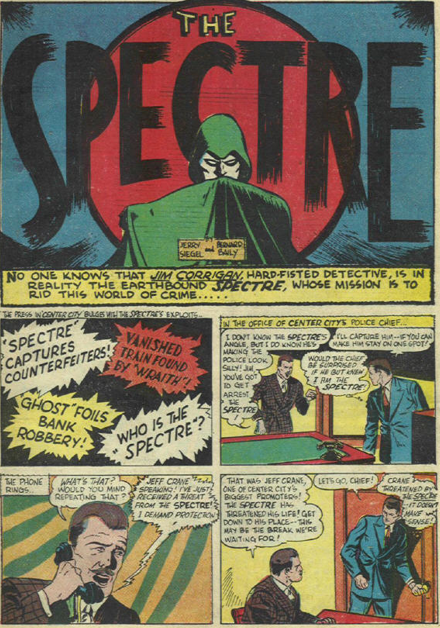 The Spectre series had been inventive, as it was, but rarely lived up to the promise of its premise, at least partly because that was so grim and disturbing. 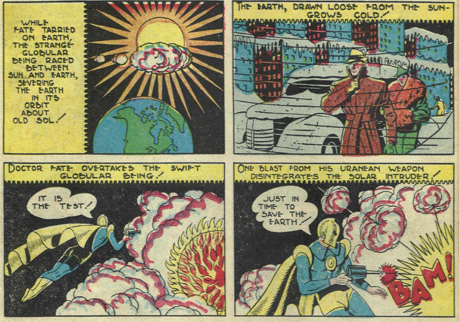 Here wer get a story about giant volcanoes popping up in downtown Cliffland, caused by a mad scientist with a teleporter. 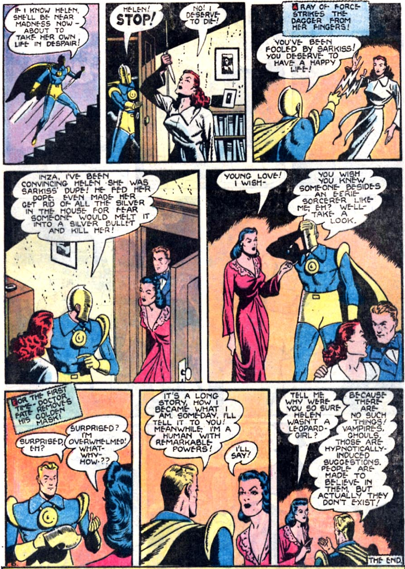 There is a strange page, in which Clarice Winston tries to get Jim to propose, just a few issues after saying they should not be married. I think we can add this together, as well as her pursuit of Jim so long after he broke it off years ago, can add to show her unstable mental state. Being attacked by lions likely doesn’t help her in the long run either. 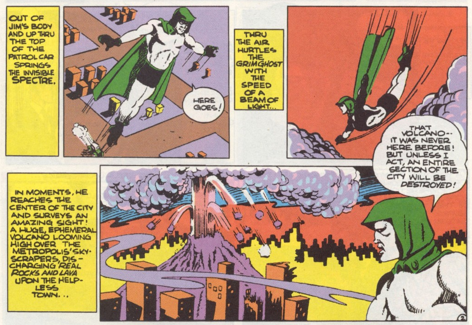 In the end, the Spectre doesn’t even save the day. It’s the bad guy’s assistant who sacrifices himself to destroy the villain and the machine. And the final panel sees a dark foreshadowing. 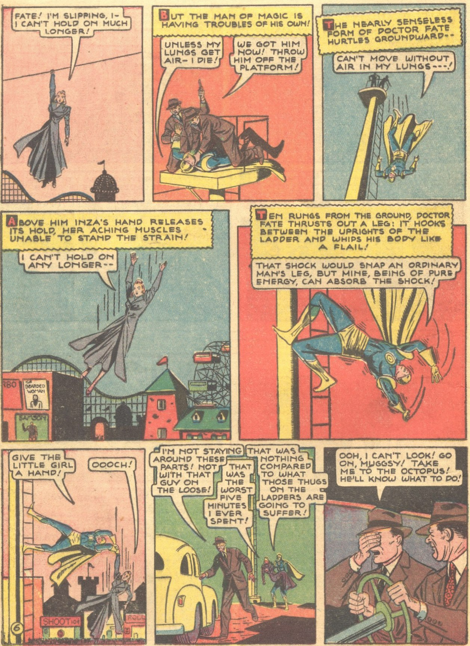 Percival Popp – the Super-Cop. What person, who enjoyed the dark, grisly elements of this series about a vengeful ghost looked at that picture and thought, yes, that is exactly what the series needs. 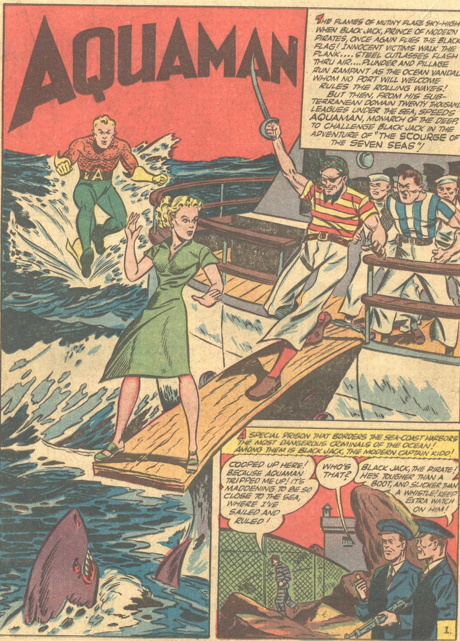 Aquaman also debuts in this issue. 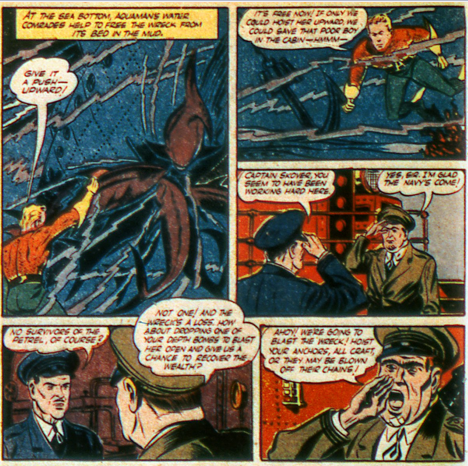 He’s just sort of swimming around the Atlantic in the middle of a world war, and is on hand when a ship gets sunk by a Nazi U-boat. 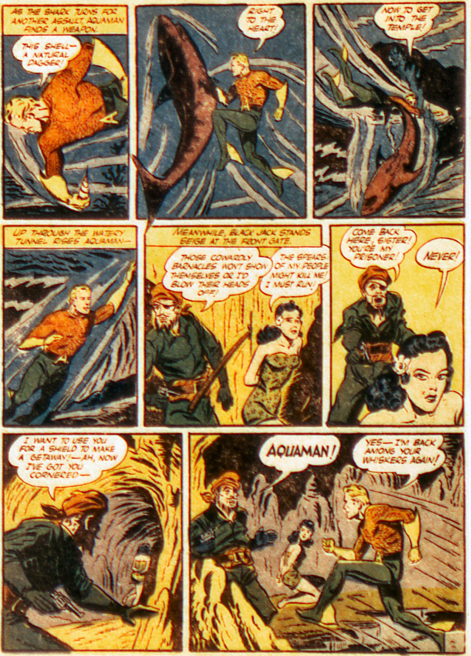 Aquaman plunges into action, whups them Nazis, and they flee. Then he gets the lifeboat to safety. He briefly relates his origin, which is far different from the one we know. Here is a human, raised by his scientist father in an underwater city that may have been Atlantis. The father used the science of that kingdom to alter his son, to make his able to live in the sea. 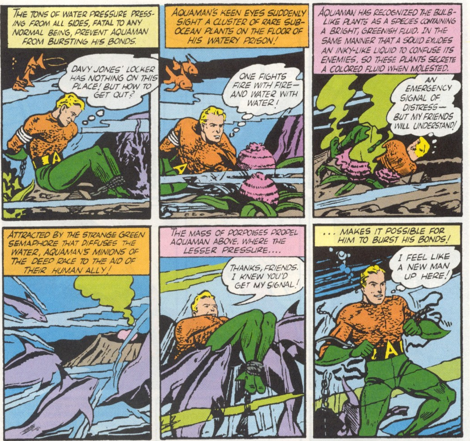 It’s a really cruel story of child abuse and isolation, so it’s no surprise when Aquaman immediately runs away after revealing it. 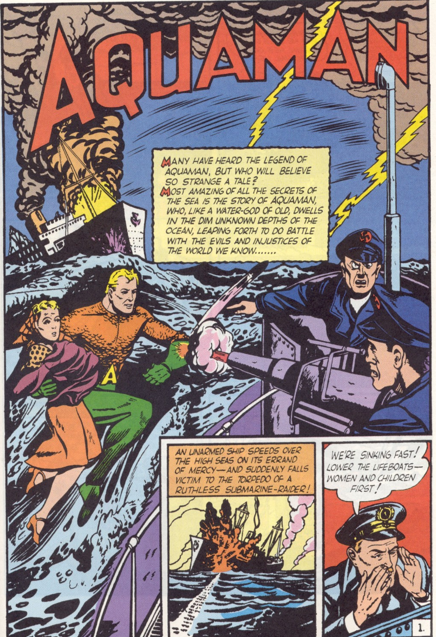 As he defeats the nearby Nazis, we also see him use his ability to communicate with fish. A barely defined character, but a series with a lot of visual potential, and a good name. 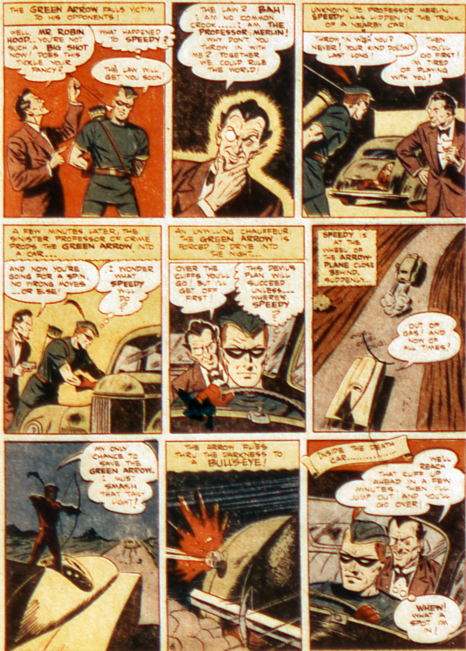 A genuinely creepy Spectre story in More Fun 66 (April 1941), by Jerry Siegel and Bernard Bailey, and for a change Bailey’s art is up to the task! 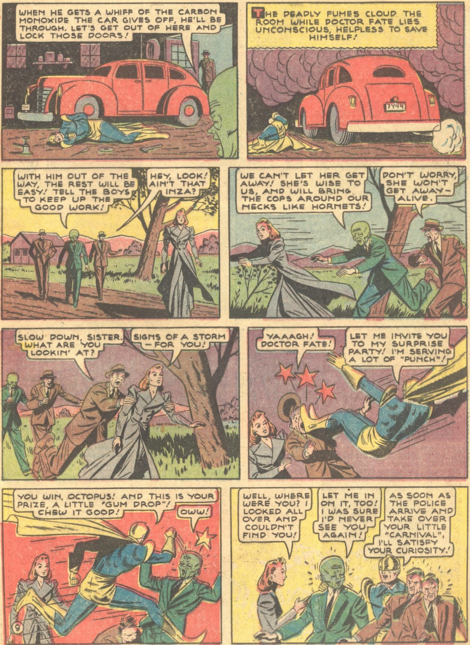 Monsters invade Cliffland, which have the ability to draw energy from the Spectre. Rare that anyone is able weaken this character. Pursuing them, the Spectre discovers that they are coming out of a painting. He enters it, finding an entire realm inside it, ruled over by a strange looking madman. He tries to capture the Spectre, who manages to escape and destroy the painting, and presumably all those within it. 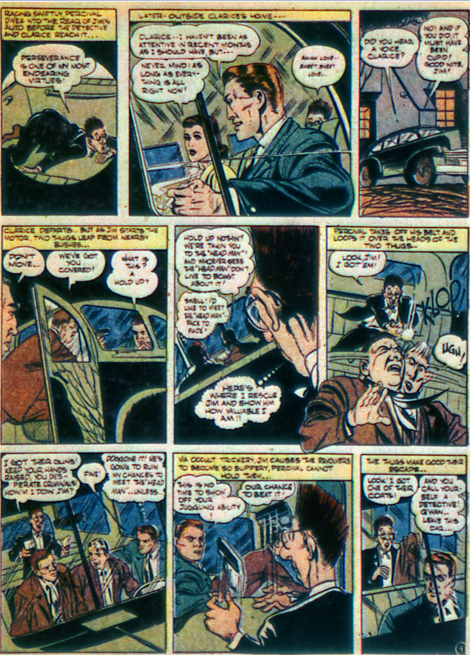 The only weak part of the story is a unnecessary sub-plot, with gangsters threatening Clarice Winston. 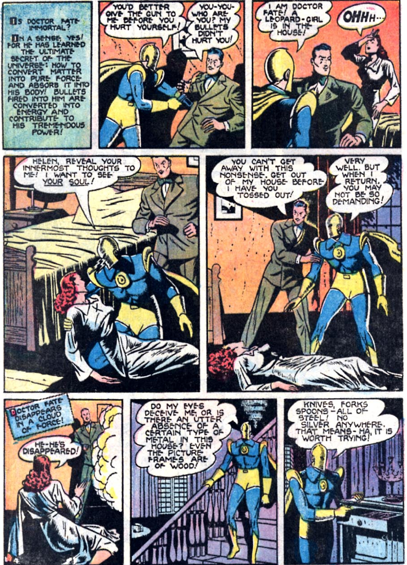 She has not appeared in the strip for a while, and does nothing in this tale beyond mooning over Jim Corrigan and screaming in fear. 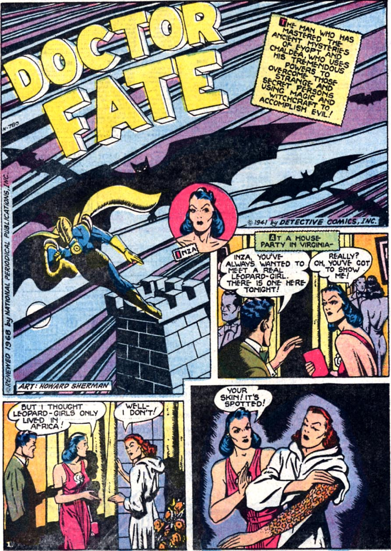 Howard Sherman does another excellent job on a decent Gardner Fox tale, as Dr. Fate meets the “Leopard Girl,” a woman with severe discolouration on her arm. The girl believes herself possessed, and is clearly going insane. It’s not too difficult to figure out that the doctor is really the culprit behind this, and the Leopard Girl an innocent victim. 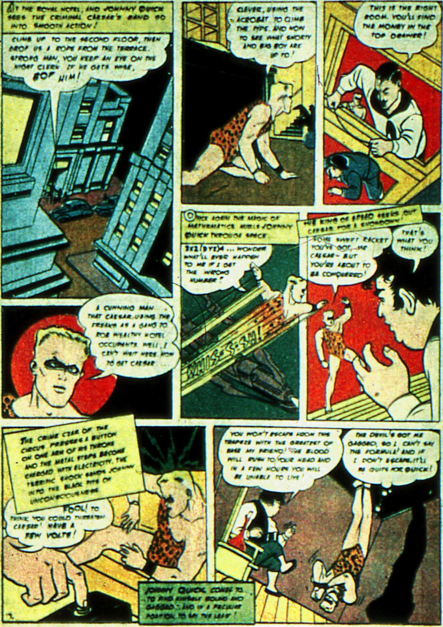 Although the story would seem to be inspired by the movie “Cat People,” in fact it predates it by a year. At the conclusion of the tale, Dr. Fate unmasks for the first time in the series. 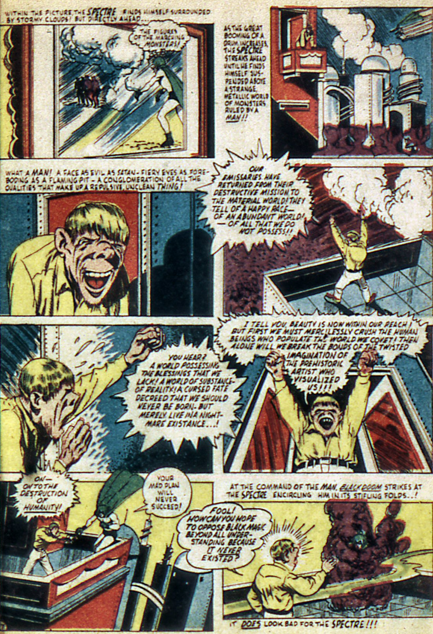 He makes a reference to explaining his origin to Inza, which will happen in the following issue. 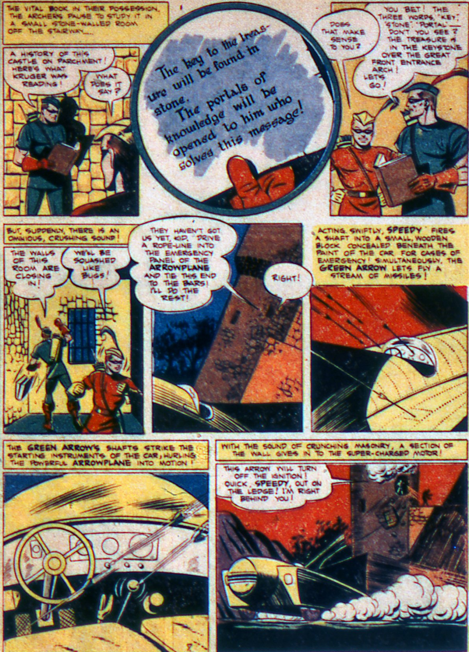 He also makes the curious assertion that there are no supernatural beings, despite having battled a few of them. 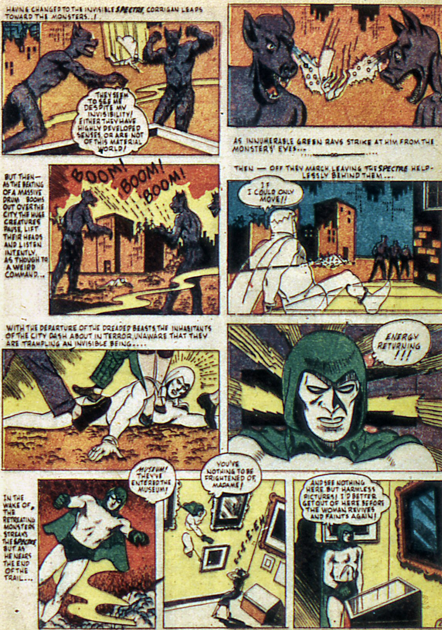 There seems to be a little bit of everything in the Spectre story in More Fun 61 (Nov 40). 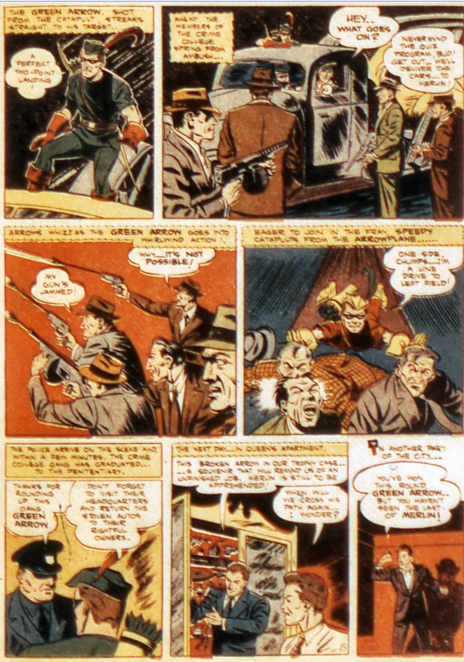 Sadly, it does not all come together into one of Jerry Siegel and Bernard Bailey`s better stories. 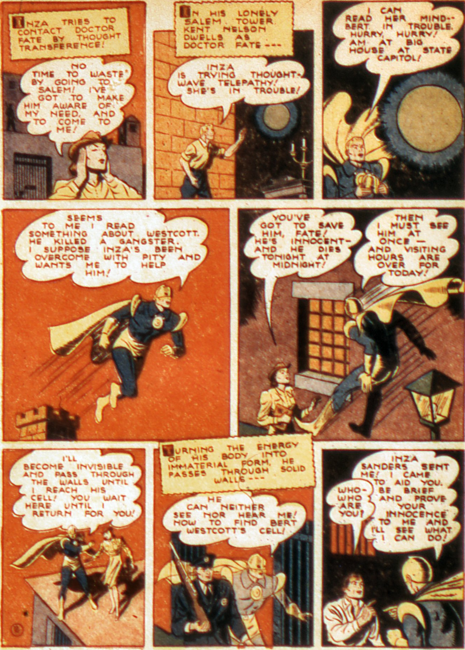 It begins with people mysteriously turning into gold, and once again the Spectre is being blamed for this. 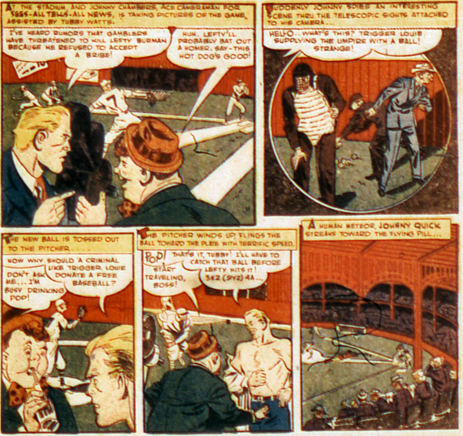 Jim quickly gets on the track of the people behind it, and pretends to fall victim to the `gold curse`himself. 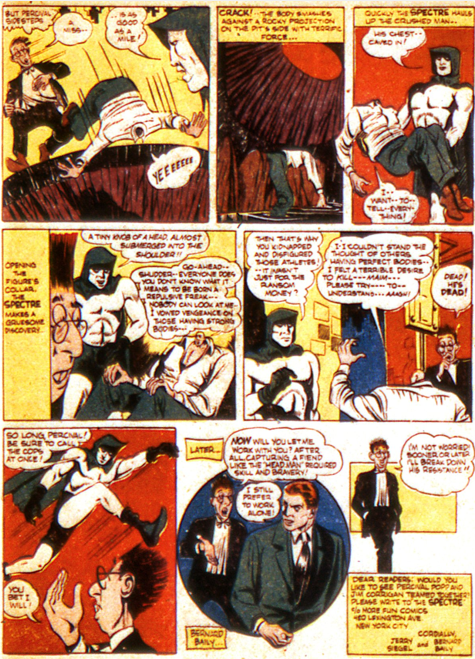 My favourite moment in the story is when Jim, ordered to bring the Spectre in, splits into both forms. 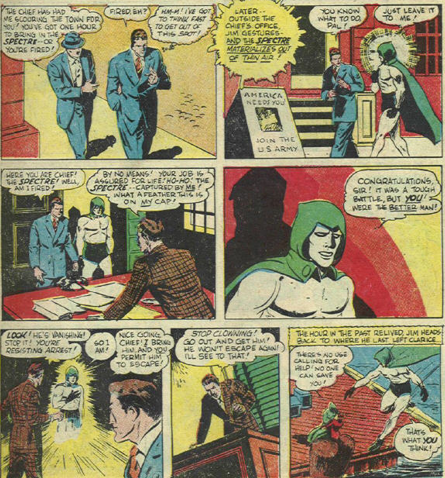 He “brings” the Spectre to the Chief of Police, and then as Spectre simply vanishes. 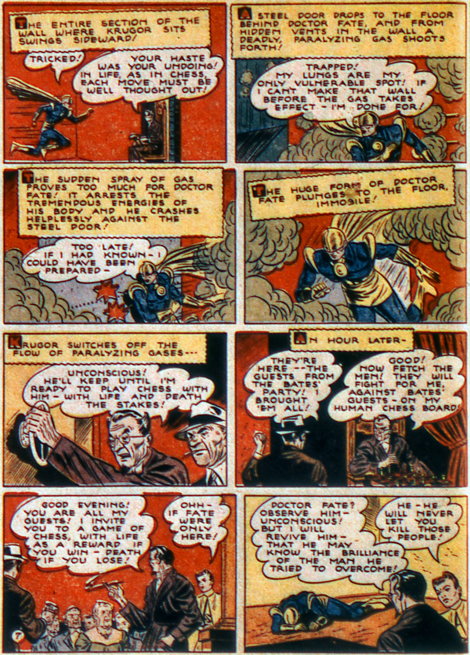 Always ballsy, he then blames the Chief for letting the Spectre escape. The “gold curse” is never fully explained, but the man behind it falls prey to it himself, dying as the story ends. The Dr. 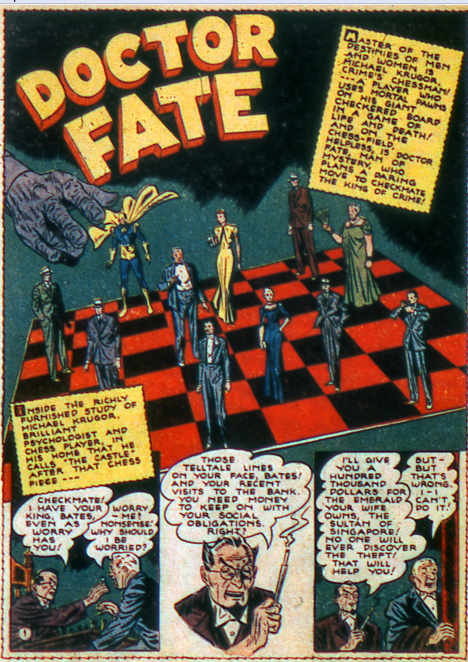 Fate story also suffers from lack of clarity, although yet again Howard Sherman’s art lifts Gardner Fox’s tale. A nebula approaches the Earth, and mysterious globes of fire emerge from it, affecting the planet’s orbit. Dr. Fate is able to shoot them with a gun and destroy them. He turns to Inza for her help in finding out what the world’s top scientists think. Somehow she has the connections to be able to fulfill this request. As she does this, Dr. 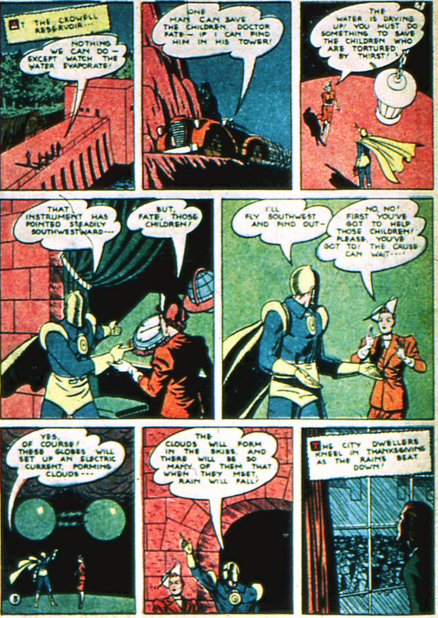 Fate heads into the nebula, discovering a planet of “Globe Men,” who he casually slaughters. 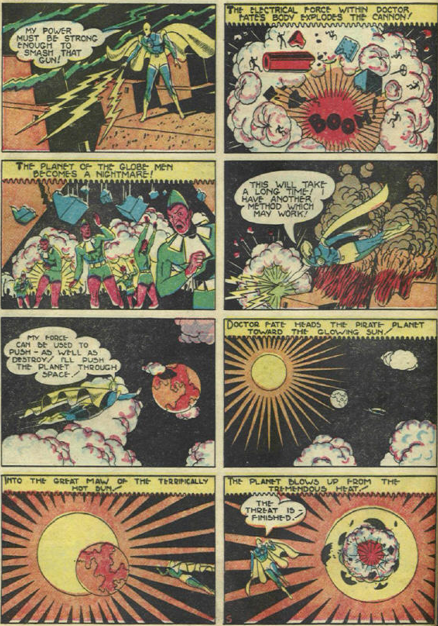 Returning to Earth, Inza informs him of a mysterious (an unnamed) mad scientist who has been using a telescope to draw the Globe Men to Earth (because he wants the planet destroyed? ), who Fate also kills. Lots of death, but not much logic to it all.